"For silicone rubber hose and other heavy-duty applications where the clamped surface must be protected. " 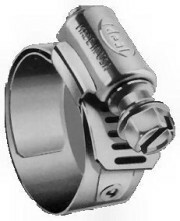 "Ideal�s worm drive clamp with stainless steel liner prevents extrusion and shearing of hose through band notches under tightening loads while providing full sealing efficiency. " Both liner and screw are mechanically interlocked to the clamp�s band. There are no spot welds to rupture under stress and corrosion.